When I signed up for this, I thought for sure that I’d be making an absolute fool of myself— possibly even revealing the depths of my crazy-looking writing process. But I’ve surprised myself. It turns out that while my early attempts at story-telling are always plagued by rogue commas and brackets, full of strange gaps and cryptic notes, by the time I reach a completed draft, it actually looks pretty … normal. The post that follows is really long. Also, there is one F-bomb, just so you know. I try to keep this place at least marginally compliant with school and parental internet filters because I don’t want people being FORBIDDEN from my blog. 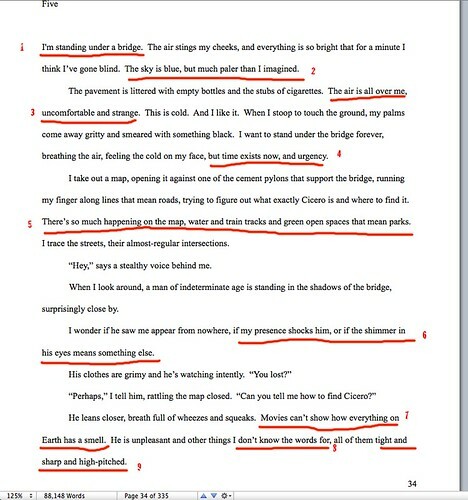 However, since the F-bomb is contained in a screenshot of my manuscript, I think we’ll be okay. To put it another way: I don’t actually write very clean books. I know—you are not surprised. But I felt I should probably say it anyway. Setting the scene—but it’s really just a post-it note to myself. Later, I’ll decide to give this opening a little more context. Not a lot, not too much, but a little. This is pertinent because Daphne comes from a place where the whole environment is pretty much grayscale-plus-red. A blue sky is something she would most certainly have expectations about. An attempt to describe the experience of temperature, while cursing myself for naively deciding to write from the perspective of someone who has no prior experience with any kind of physical sensation. Again, trying to show Daphne working to make sense of things she’s never had to think about before—in this instance, the concept of time—but it’s hitting the page in a very abstract way. Presenting the world as a series of units, not only in an attempt to convey sheer size, but because Daphne has a tendency to break any large idea into manageable pieces. Daphne’s entire notion of Earth has always come from a purely visual representation, and now it’s expanding to encompass other senses. Reiterating the separation between what she’s experienced before and then, what the world is actually like. Daphne’s voice developing, inventing her own vocabulary to describe all these concepts she doesn’t have any practical knowledge of. An action that shows how naturally compliant Daphne is, how ready to be obliging. This is Daphne focusing on small details because they seem fascinating, rather than big ones that might tell her something pertinent about the situation. Again, a sense of pure curiosity, taking an interest in every piece of new information. Misinterpreting what ought to be a recognizable threat. Throughout the book, Daphne typically attributes good intentions to people, and particularly to human people. Responding to the object rather than the gesture, inability/disinclination to read intention. Not a taunt or a challenge, but a purely honest question. The first indication that Daphne has some exciting new abilities she doesn’t have at home. Still trying to find Daphne’s voice when it comes to sensory details, while also demonstrating that she’s totally unshocked by the fact that she just burned a man with her hands. Reiterating that Daphne is a pragmatist above all things. Even post-mugging, she’s still focused on the knife, which happens to be the most beautiful thing on hand. Even in this completely new environment, she’s carrying a lot of the person she was at home in Pandemonium—easily distracted by anything pretty or interesting. Her radio dial is still tuned almost exclusively to novelty. In the interim, I have added … chapter titles! This is deceptive, because in the rough draft, this chapter is designated number five, so it would be totally reasonable to assume the beginning of the book got longer in revision. But no, is actually shorter. I just broke up some of the earlier chapters. It’s actually been a little while since we were in Daphne’s POV, so I needed a sentence to remind us where she was when we left her, in order to set the new scene. Daphne’s voice has solidified over the course of revisions, and she’s definitively become an “expected” sort of person, rather than an “imagined” one. In keeping with that, she’s consistently more factual, more direct. As Daphne’s character began to develop, there’s a new layer—this idea of otherness and what it means to be a demon on earth, what makes it different from home. It hasn’t really come to light yet, but I’ve added some small exploration throughout so that when we get to it, the big issues don’t come as a surprise. I’m working to crystallize the way Daphne expresses the idea of time. The revision process has made her much more concrete in the way she assesses situations. It’s a pretty dreamy book in terms of tone, and I ultimately felt like Daphne needed to offset that, rather than exacerbate it. Urgency seemed way more abstract than simply getting down to business and trying to quantify the amount of time she has at her disposal. While early Daphne was quite comfortable referring to a map, this Daphne feels a definite sense of ownership over everything she’s brought with her. The character has evolved enough to know what Cicero is, but not necessarily the geographical location. This is a rare example of revising to be less specific. To that end, I decided I didn’t need to describe the map, but rather Daphne’s very casual reaction to the size of the world. Adding some context to the interaction. Even though the extra dialogue doesn’t tell us a lot about the speaker, it gives us a little bit more than the previous generic disembodied voice. This gives the reader a clearer idea of where the man is standing in relation to Daphne and how that reflects the geography under the bridge. Also, I felt like in the original version, it was unrealistic that he would be able to come so close without her noticing, so here I’ve moved him a little farther away. Changed the description to something more physically specific, less impressionistic. I rephrased this to make the paragraph flow better and also to further downplay the ease with which she follows him. I took out the reference to thorns because I wanted to knife to seem totally harmless in all aspects, even little tiny superficial ones. Added Then to give the action a greater sense of force/aggression. This is when she finally interprets the situation, and I feel like the then gives it a little sprinkle of shock—why is he being so unreasonable?! As you can see (you can, right—I’m not making this up? ), my rough draft is all about the character. I almost always use my early versions of stories to find character and voice, get a sense of what they notice, what they sound like, what they think about. And then by the later drafts, it’s mostly a matter of kind of shaping that character, defining them, sanding off the edges, and turning my attention to the surroundings. Also, I want to just take a second to address the fact that apart from bunches of little nitpicky stuff, not a lot about this scene has changed from rough to final, even though the book actually went through a lot of drafts (so, so many*). The reason for this is that most of my revised scenes wouldn’t be remotely helpful on a line by line level because I routinely throw so much stuff out. And the line level is what this exercise is all about. Anyway, I wanted to at least explain that this tidiness is not typical of me, because otherwise I’d feel like I was lying to you. Love the changes! Also love how you start with character, and then give yourself permission to sharpen character and “embiggen” scene elements during revision. Great idea! If I might ask, what word processor do you use? And how do you set the margins and whatnot? Is there a certain page size you aim for, or do you just sort of write it and then know how many pages there are per chapter? It looks like its double spaced, which is about the length of a book page, right? –questions from an aspiring author. Never fully answered because there are always more popping up. So. I currently use Pages, but before that I used NeoOffice and before *that* I used MS Word (and before that I used Word Perfect), so I feel like at this point, I can pretty comfortably say that for me, it doesn’t make a big difference. Right now, I like Pages because it handles big documents really well (my other programs would sometimes stutter or freeze when I tried to scroll). As far as formatting the margins and stuff, I just use the default setting for whatever program I’m using, and I always keep track of my wordcount rather than trying to figure out how many pages something will be in book-form, since typesetting varies *so much. * (And honestly, so does chapter-length.) Basically, my personal philosophy is that the right tool/method/format/technique is whatever gets it done! Great! I had been wondering about it. This whole thing has been pretty interesting and helpful. I think it’s cool you guys did it. Thanks! Ooooh, thank you for this!!! Very cool! This was fantastic! 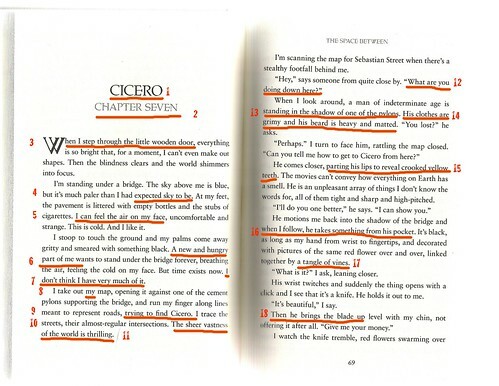 I love analyzing why/how things work in novels, and this was extremely helpful. Though, now that you mention the other revised scenes, I’m hugely curious. I’ve always wondered how authors decide to throw away such big parts of their books – is it because the plot isn’t working? Because the scene is redundant? Because it’s not going to be part of the story after all? Because the characters aren’t developed yet? Anyway, this was such a fantastic post – thanks so much for sharing! Well, I can only answer for myself, BUT. (It’s mostly just all those things you just said.) A lot of my early scenes tend to retread the same ground in various ways. I’m usually still trying to figure out which parts are important to the story, and exactly how important, so later drafts involve getting rid of things that are irrelevant and combining things that are just repeating each other. Thank you so much for this, Brenna. It was very interesting to read, especially because the end result was so stunningly good. I wonder how much time you spent working on the prologue. it’s one of my top 3 prologues of all-time. Very… effective. Thanks so much for taking the time to do this. I really appreciate the insight! Thanks so much for sharing the step-by-step process of the writing process with us. I plan on printing off your posting and filing it away so that I can use it as motivation to sit down and write someday. Thanks for that. Aw, thanks! And actually (thrillingly), I learned just the other day that The Space Between made it onto the Best Fiction for Young Adults list, 2012, so celebration abounds! I loved this. Ive read so many books on writing I sometimes get confused, or worse, forget things. It’s nice to see a YA author at work. It’s not do as I say, but do as I do…maybe? Rather just do it your any-old-way. I love it. Till I read your blog I thought the way I wrote was insane. I jump all over the place. I’ll work on chapter one then jump over to a story somewhere in the middle of the book, then back again. Leave holes and spaces everywhere. You’d think I was on crack! I can’t wait to read all the other blog posts. I think this is actually probably one of the more maddening things about writing advice, because if you don’t write using a process that’s recognizable to other people, they look at you like you’re talking crazy! Hi Amy, I’m really glad you liked it! I’m always very interested in bad people who do good things, and good people who do bad ones. Also, it’s often the strangest, seemingly-silliest ideas that make the best stories, because we don’t necessarily see them coming! Your book is the best book ive read all year! i may be only 15 but i know books. i usually never have time to read between my friends and sports. but your book….oh my gosh. it was so great. most people favor the main character. but i loved Daphnes cousin. when i first read about him i thought he was gonna be a full-of-himself demon. but he really wasnt. you are the best author of the year. i hope you write more books soon! i cant wait! Oh, YAY for Moloch love! You know, when I first started writing him, I thought he was going to be just awful—arrogant and nasty and totally insufferable—and no matter what I did, he just didn’t want to be! Anyway, he was definitely one of my favorite characters to write, because he could always surprise me in pretty much every scene.